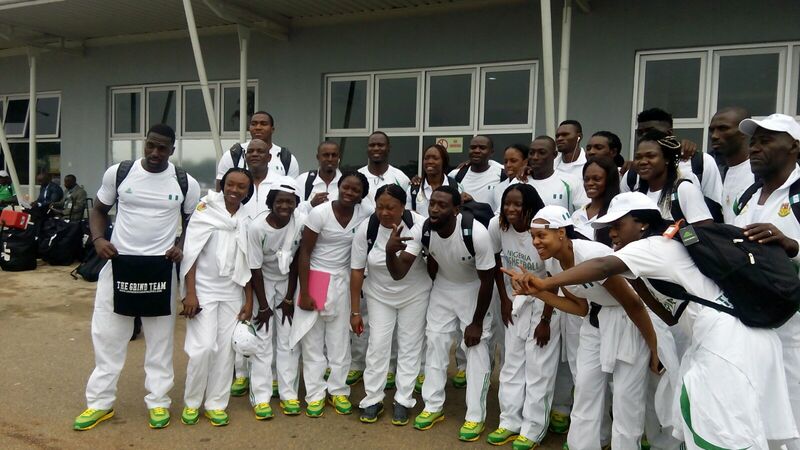 Nigeria’s 573 –man contingent to the 11th All-Africa Games in Brazzaville, Congo departed Nigeria from the Nnamdi Azikiwe International Airport, Abuja on Monday. At the airport to see the contingent off was the Director General, National Sports Commission, Mallam Alhassan Saleh Yakmut, some federation presidents and NFF General Secretary, Dr. Mohammed Sanusi. The contingent consisted of sportsmen and women in 21 sports, as well as technical and administrative officials, including football players of the Senior Women National team, Super Falcons, and the U-23 National Team. The Super Falcons will play host team Congo-Brazzaville, Tanzania and Cote d’Ivoire in Group A, while the U-23 boys will take on Ghana and Senegal in the men’s Group B that has been depleted by the withdrawal of Egypt. The Dream Team, Olympic champions in 1996, will play their first match of the competition on September 9, against Ghana’s Black Meteors, who won Olympic bronze medal in 1992. Hosts Congo-Brazzaville, Sudan, Burkina Faso and Zambia make up the men’s Group A. The women’s Group B has Cameroon, South Africa and Ghana, also depleted by the withdrawal of Egypt’s senior women team.